Employers come to our campus to recruit students and alumni for jobs and internships. Some Career Fairs are designed to connect students to employers in specific areas. However, many employers recruit from across all majors and train college graduates for a variety of careers. Even if you are not ready to apply now, you can start preparing by networking with recruiters and learning about upcoming opportunities and requirements. Also, graduate and professional schools attend fairs to provide valuable information to students contemplating graduate programs. See descriptions of recurring career fairs (below). Career fairs and other events are offered throughout the year. View our current calendar of events. Take advantage of the opportunity to meet employers and alumni who want to talk to you about their occupations and employment opportunities. Gather information on career options, develop a network of contacts, identify job openings, or secure an interview. Review these career fair tips. Download the Career Fair Networking Guide and career fair success presentation. Attend our workshops to help you develop your resume, professional look, and networking skills. Bring copies of your resume and be prepared to ask questions. 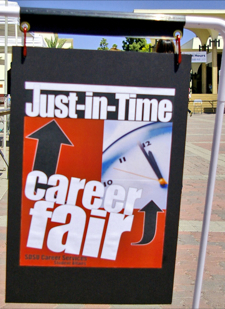 Career Fairs provide a forum for students and employers to meet and talk informally about full-time, part-time, volunteer, and internship opportunities. We recommend that students attend a pre-Career Fair workshop, which is usually held a few days or the day before a Career Fair, where you'll learn some important do's and don'ts.